This mod adds several new types of bows and arrows which have their own unique properties. For example, there is a fiery arrow which will ignite everything if will fall in the area. The teleport arrow will move you to where it falls. How to use bows and arrows? In total there are 6 types of bows and arrows. You need to be crafted in a crafting table or get by TMI. Take a bow in hand, and press the «F», and then a bow automatically shoots. However, it should be remembered that all the arrows will fly in an arc. So when you take aim, especially if you shooting at long distances, the aim above target. Find texture and click on it to add. Find script file and click on it to add. Ender Pearl Mod for Minecraft PE 0.12.1This modification will add Ender Pearls to your game inventory of Minecraft Pocket Edition 0.12.1. This element can produce high-speed movement and something else. Rys Arrows mod for Minecraft PE 0.11.1 / 0.11.0Rys Arrows adds a 5 new bows, which have different properties. 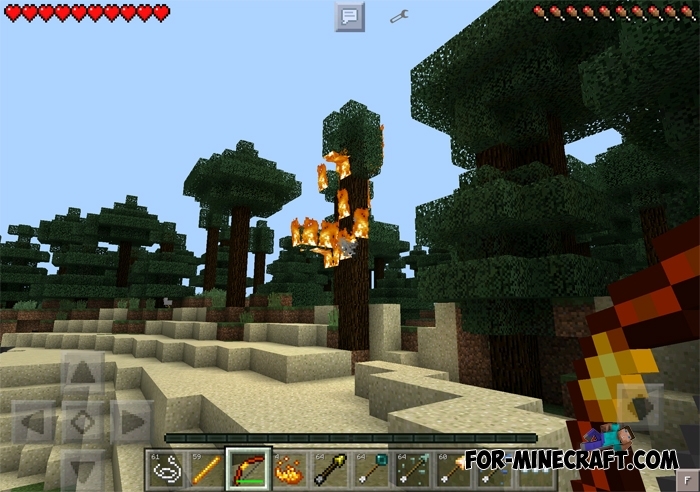 For example, when you shoot with the TNT bow, then there will be an explosion, etc. Du bist h?sslich FUCH !!!! !